Our office is easy to find! Simply take Business 51 North to Hwy CX and Gunderson Dr. 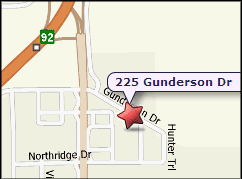 Turn Right on Gunderson. We are located two blocks down on the left side. We have onsite Parking for your convenience.